I got this [very cool] die from Simon Says, Circle Loops, and love it! I took a piece of card stock and used a smooshing technique where you put Inka Gold and re-inker drops directly onto your worksheet, spritz with water and lay the card stock on it. [You can see Loll's video showing the actual technique HERE] Once my paper dried, I then cut out the die cuts from the paper. I love the multi colors that show up. Added a few sequins and a sentiment from Altenew Label Love, and my card is finished. 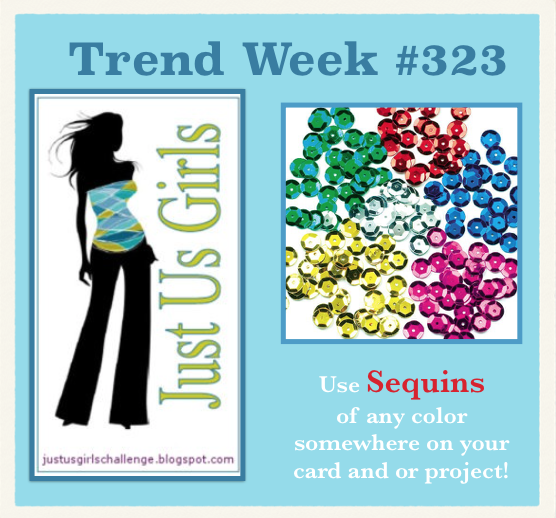 We look forward to seeing how you use sequins! Be sure and check out the Team samples -- lots of ideas! See you over at JUGS #323. I love the wonderful colors on your circles. What a fun design! Oh, this is outstanding, Vicki! You really made that die shine! Love it, Vicki! Thanks for the video!! I love your design with the circles and all the sequins. Really wonderful card design and great colors. This is the COOLEST Vicki. Oh I just can't stop looking at it. So cool. Your "smooshed"circle are beautiful Vicki, this is amazing!! Very cool card and die! I love the effect you achieved on the circles! I love that die and how you used it! Awesome design! Great results with your smooshing. Love those fun loops and how the colors blend so well! Nice CAS design! HUGS! This is fantastic! What a great die! Nicely done! Now this is an awesome CAS card! Love that circle loop die! Oh my, Vicki...this is sheer delight! The loops, the colours, the sentiment: gorgeous! I'll be investigating that die for sure!